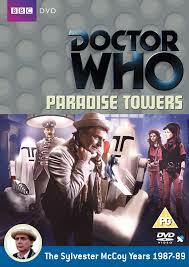 ‘Paradise Towers’ is certainly not a perfect Doctor Who tale by any stretch of the imagination; however, despite its inconsistencies in both tone and pace, it unabashedly represents a fresh breath of experimentalism that suggests the programme is truly ready to embrace a new era after the rather bland introduction of Sylvester McCoy’s Seventh Doctor in ‘Time and the Rani’ that had failed to properly introduce the actual characters of the Doctor or Mel to the audience at home. Even though it’s clear that both the writing staff and McCoy have not yet settled on a definitive characterization for the Seventh Doctor as he shifts between bumbling and hesitant and darker and more contemplative, ‘Paradise Towers’ firmly embraces 1980s cyberpunk culture without holding back, using its more absurd science fiction elements to speak about remarkably relevant social topics without feeling the need to reach the levels of grim despair such attempts did in Colin Baker’s era. Within the confines of the titular towers, urban decay, fascism, gangs, and even cannibalism reign supreme, but the story somehow manages to balance a line between terror and absurdity that never demands that the audience take it completely seriously and that never feels exploitative of anyone involved. Indeed, with allusions to many classic novels and excellent imagery thrown in, ‘Paradise Towers’ offers a remarkably biting look at several socially relevant issues in a very accessible, if sometimes over-the-top, manner. Perhaps more remarkable is the shift in the political commentary on display from the conservatism of the previous story in which- symbolically- unemployment was the result of people simply not wanting to work. In ‘Paradise Towers,’ the small society has completely degraded and each and every person is out for him or herself first and foremost. With the elderly willing to eat the young and the young growing up without any sort of structure or guidance and resultantly forming their own sub-cultures, the biting commentary on display is undoubtedly anything but conservative in nature. Still, there is a bit of a contrast between the more subversive nature of the script and the rather traditional production and direction styles that keep the story from reaching its full potential of ingenuity. Over the past several years, Doctor Who had become increasingly concerned with fleshing out every aspect of the Doctor, Time Lords, and Gallifrey, so that all three were essentially known quantities aside from a few quirks now and again. However, as a sort of precursor to what would become a much more consistent type of writing for the Seventh Doctor, there is an air of mystery around the Doctor’s past, specifically in keeping open the possibility that the Doctor is, in fact, the designer of the complex who disappeared just before anyone moved in. While this is ultimately proven to be false, the script and the Doctor’s use of rotating pronouns keeps up the charade far longer than is typically the case for a case of mistaken identity, adding another intriguing layer to the story until the truth dwelling within the basement is revealed. Though there are certainly some missteps for this overly long script, the generic use of Mel one of the most egregious, ‘Paradise Towers’ certainly has enough going for it beneath its hyper-stylized air of absurdity to earn at least a place in the discussion of where the McCoy era started to find itself on its new trajectory.